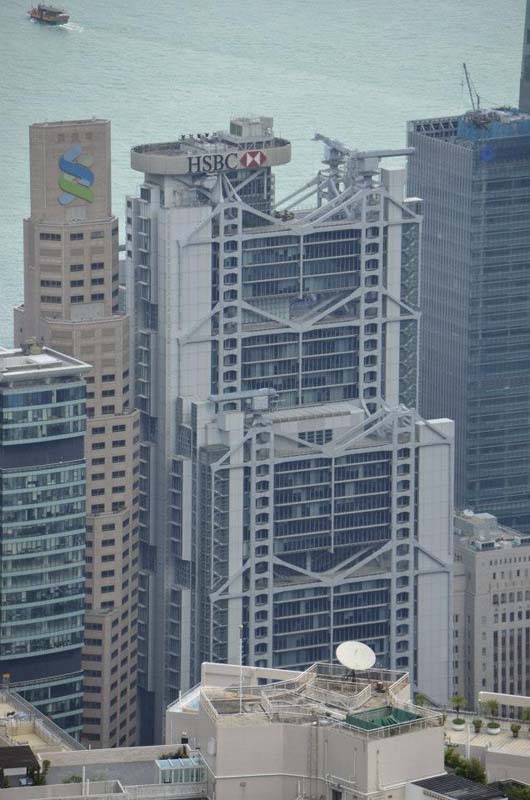 • Design Arup Associates;	Cleveland Bridge Ltd.
As the formal exchange of power away from British control in Hong Kong was approaching, The Hong Kong and Shanghai Bank wanted to make a bold statement when the need for a new headquarters was conceived. 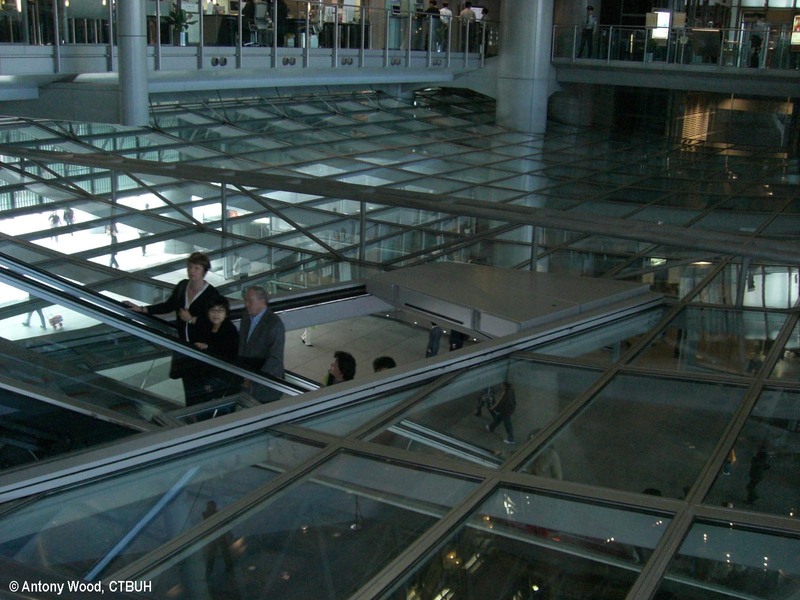 Planning began in the 1970’s with the need to construct over one million square feet of space (92,903 square meters), all of which needed to be built quickly with a very tight construction schedule. 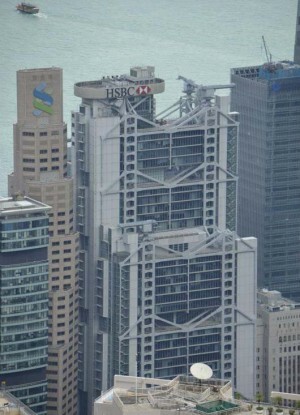 The project would also need to address the nature of banking in Hong Kong and adherence to Feng Shui principles. 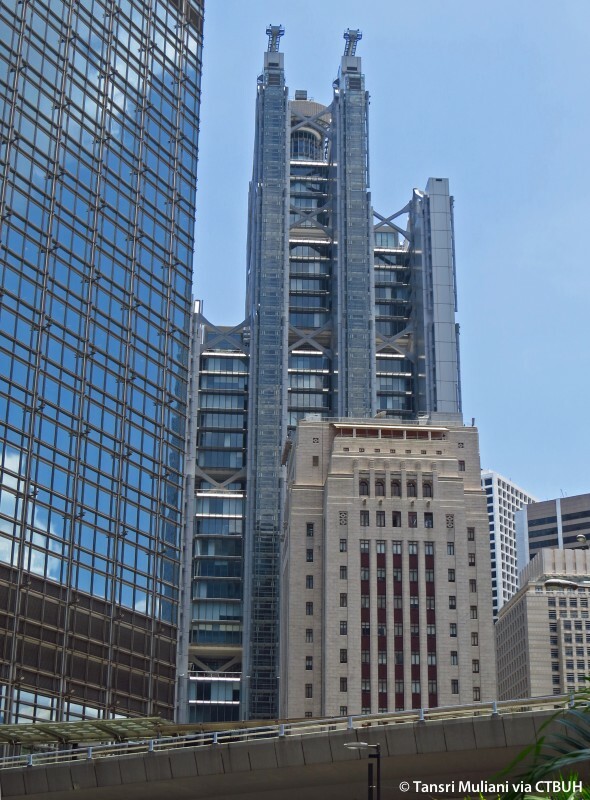 All of these factors led to the design of Hong Kong and Shanghai Banking Corporation Headquarters in a method which rethought how an office tower should be composed. 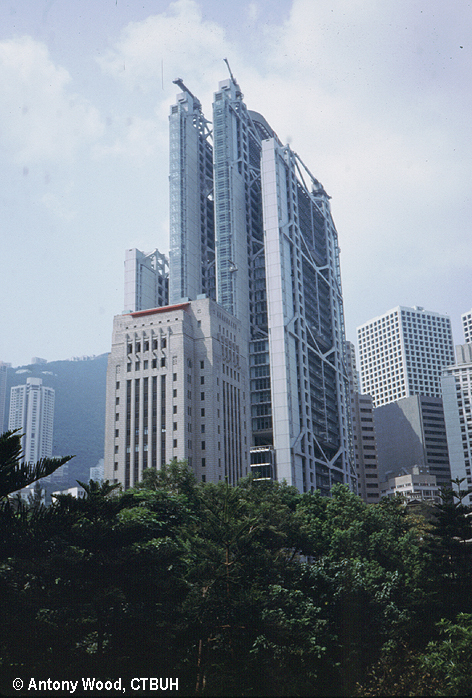 The short construction schedule required prefabrication of many building components in a global supply chain sourced from the United Kingdom, Japan, The Netherlands, Germany and Italy all then assembled in Hong Kong. 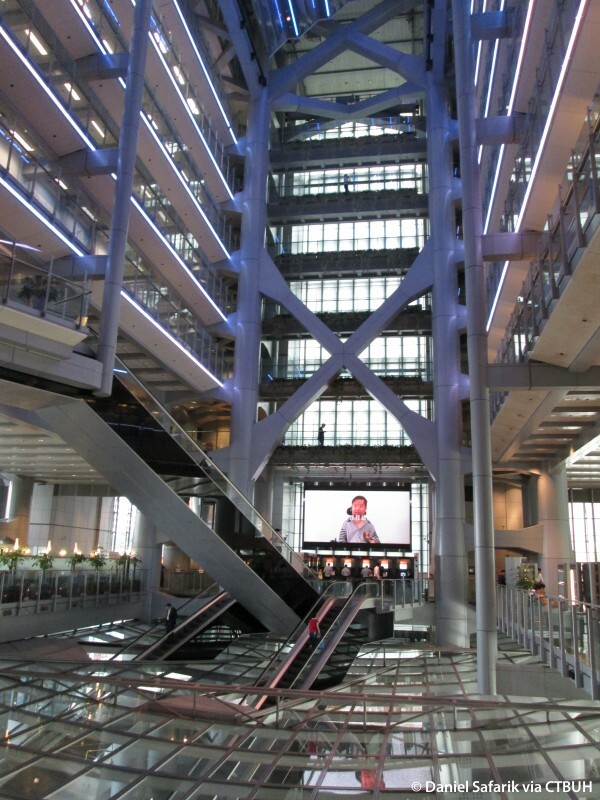 The open space needs of the bank led to the placement of elevators, stairways and building services at the ends of the office floors, rather than in the typical center of the floorplate. 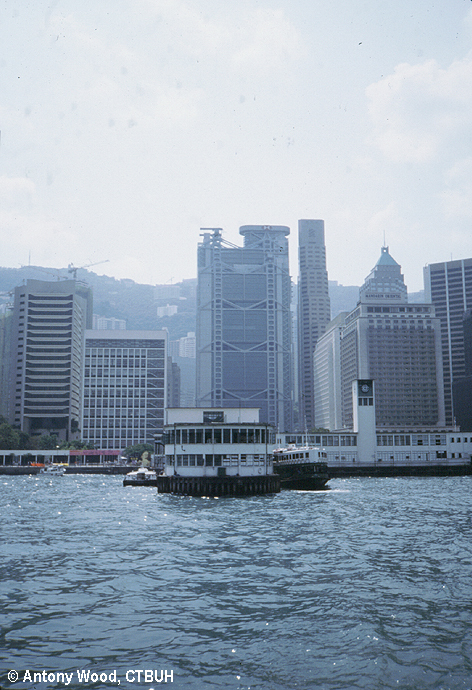 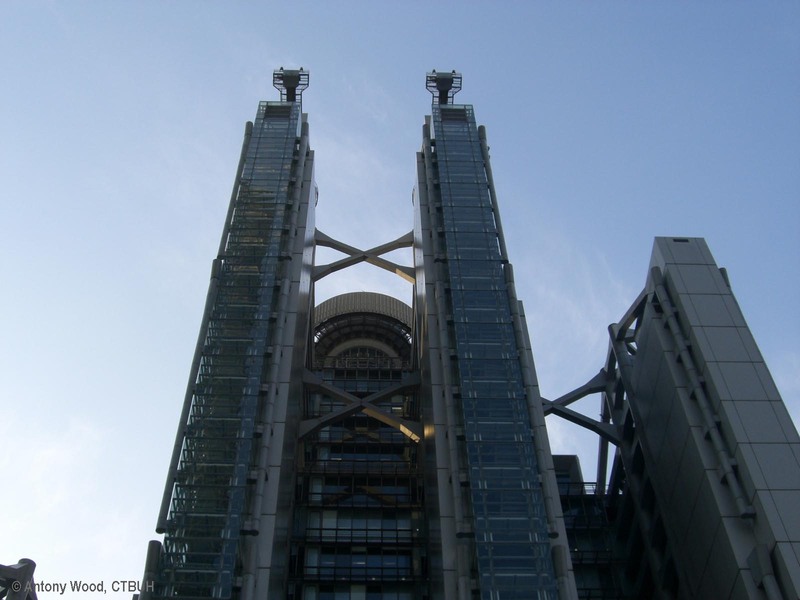 The building then took on a rectilinear form, with the broad sides capturing views of the mountains and Victoria Harbour while the floors were suspended between the cores and pairs of steel masts located at the ends of the building. 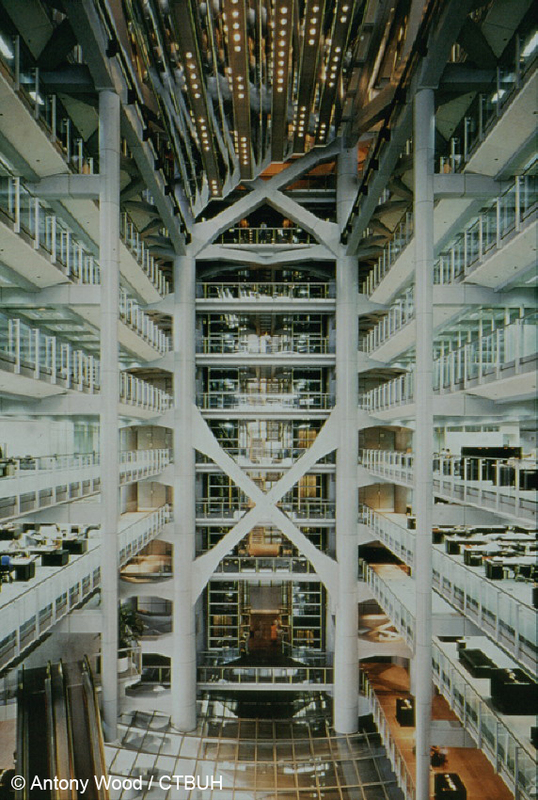 The building’s floor space is then broken down as a series of three office towers rising to 29, 36 and 44 levels, all arranged around a central indoor atrium with blocks of office floors clustered as a series of vertically stacked villages. 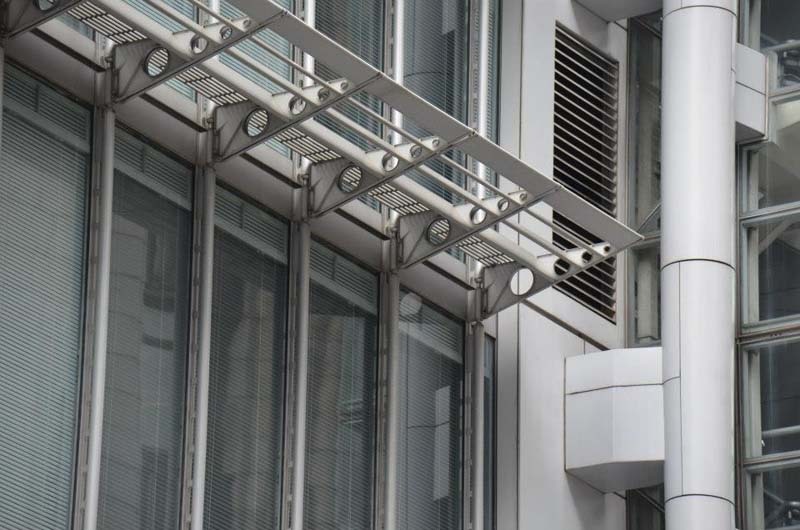 The boundaries of the office clusters are visually expressed on the exterior of the building as well, with large triangular trusses framing double height floors which serve as communal areas. 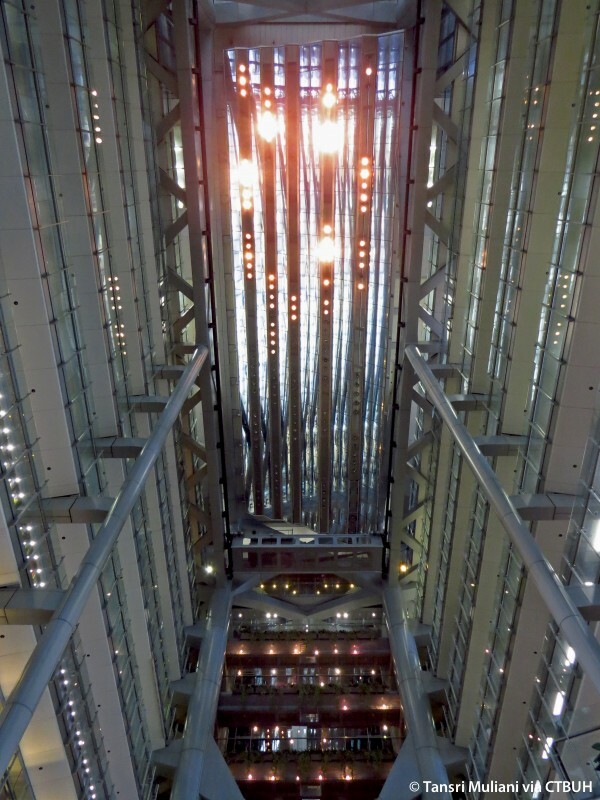 A mirrored sun scoop reflects natural daylight into the atrium and through a glass ceiling between the interior of the atrium and an open-air public plaza below that has since become a popular gathering spot for picnics on weekends. 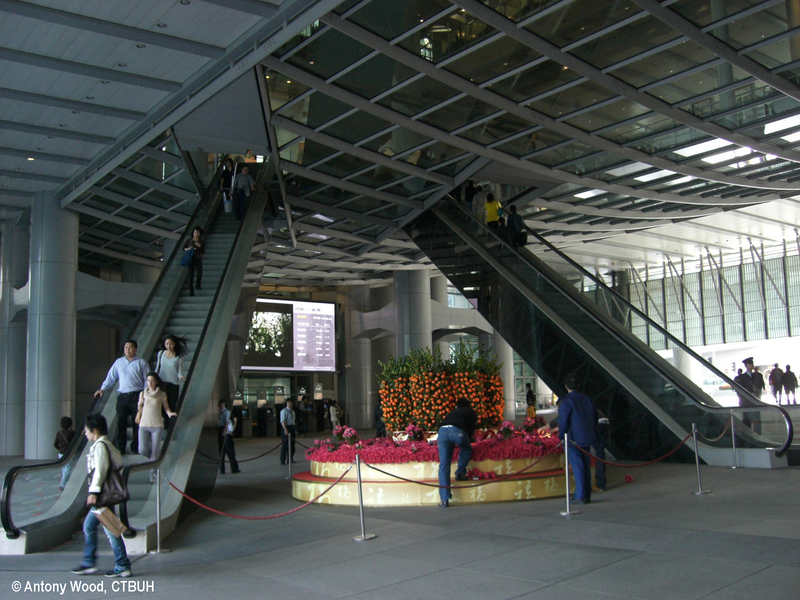 A pair of escalators then links the plaza to the banking hall elevated above the ground level. 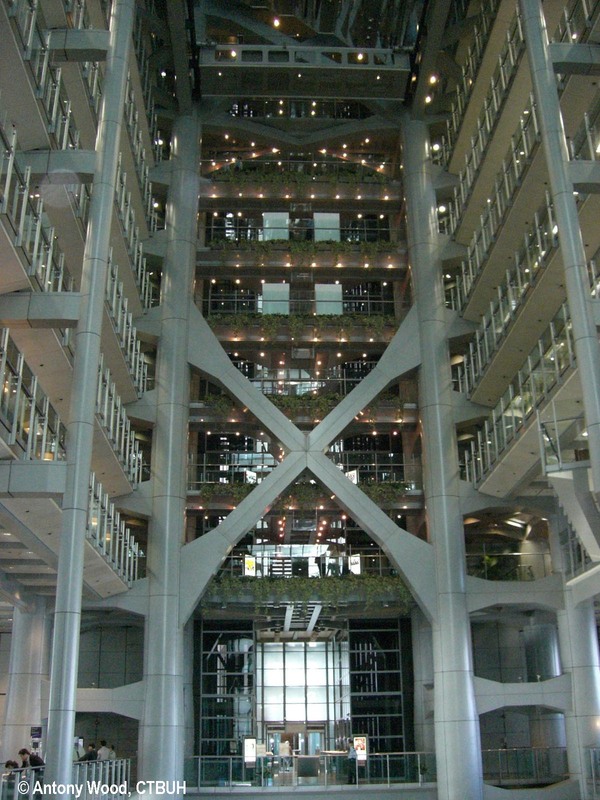 The flexibility of the open floor plans has allowed the company to adapt the spaces since the building has opened, including the construction of a dealers room into one floor which could not have been added within a conventional office building with a traditional column grid. 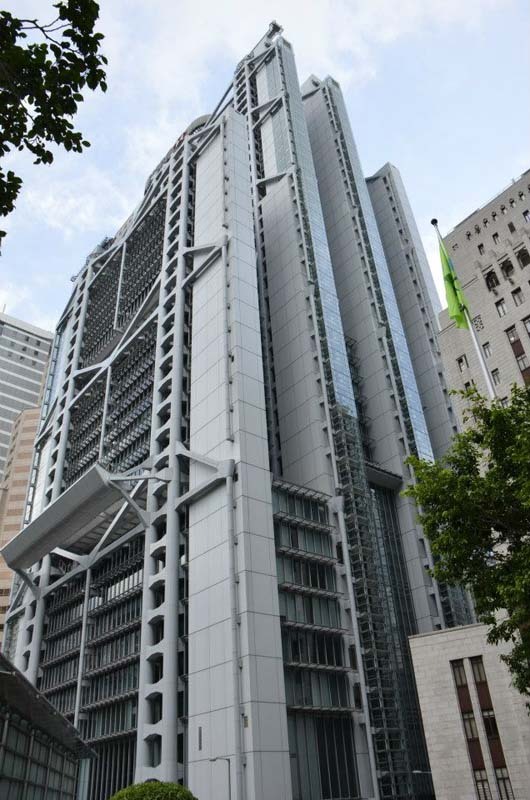 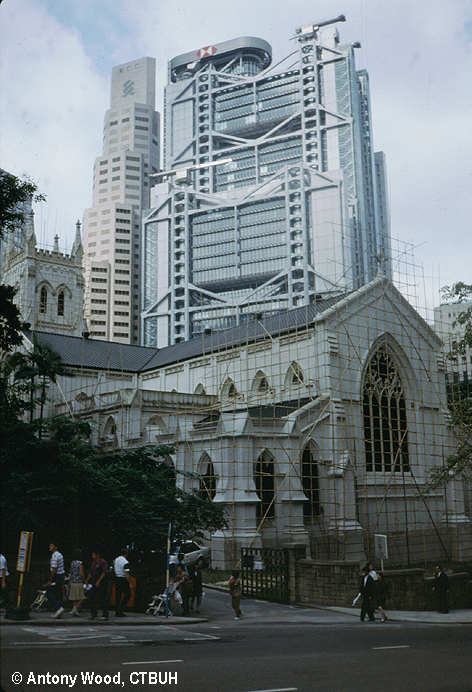 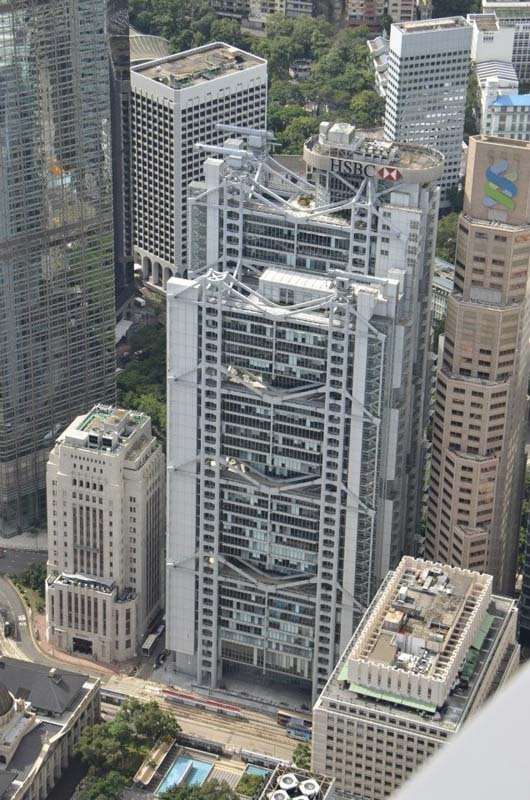 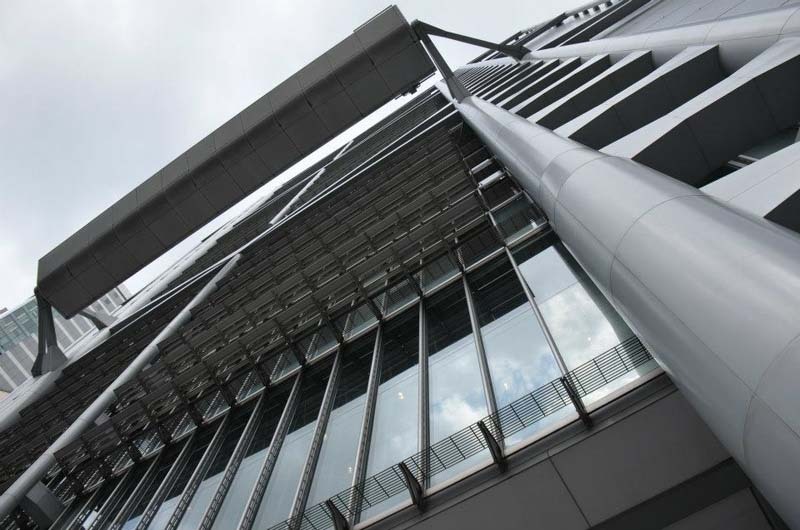 The Hong Kong and Shanghai Banking Corporation Headquarters has become local icon, achieving the original goal of creating a headquarters in a unique tower that would become a long lasting landmark in Hong Kong as the modern skyline has rapidly grown up around it.